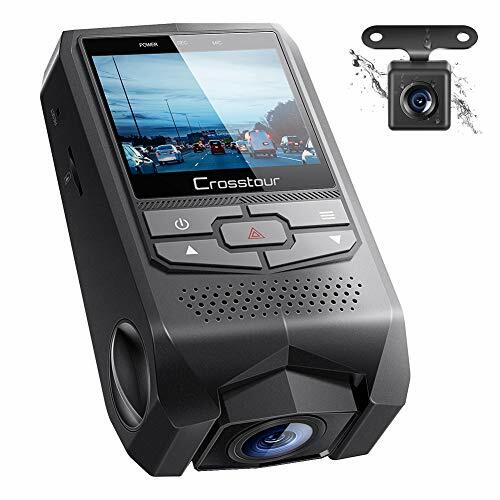 【Dual Lens 1080P Front and Inside Dash Cam】Based on the Novatek NT96660 CPU, equipped with Sony Exmor IMX323 sensor (inside car camera) and OV4689 (front car camera) image sensor, the dual 1080P wide angle dash cams simultaneously captures the road front(170°) and inside the cabin (140°) in crystal details at dual 1920x1080P 30fps. Or utilize the front cam only to record road front at 2560x1440P@30fps or 1920x1080P@60fps, capturing license plates clear. 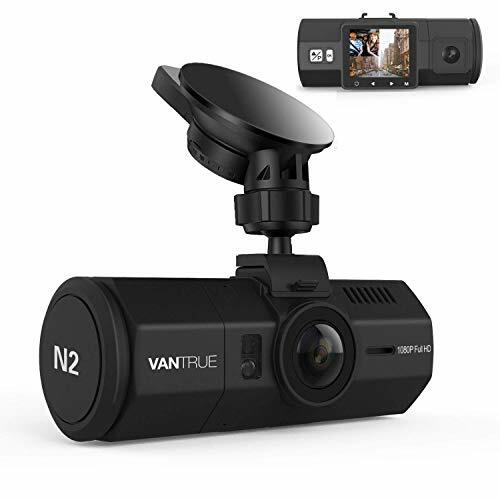 The Vantrue N2 Dash Camera is a first for me as it features not one, but two cameras. The first camera is your standard front facing camera to capture what is going on ahead of you. The second is a rear facing camera to capture what’s going on in the car. There is a little screen on the back which is really useful for getting the camera positioned correctly and going through the various options available. The camera comes with a brilliant windscreen mount which has a USB port for the power cable, meaning when you want to take the camera out of the car you don’t need to disconnect it from the USB cable. The provided USB cable has also been smartly designed as it’s not just for powering the cameras, but also acts as a USB point if you want to charge you mobile on the go. Setup is easier enough, you’ll want to spend a bit of time in the camera menus to set things like the time and date. There is also a GPS menu but that appears to be for if you purchase a GPS addon. Footage is very good and the benefit of having two cameras becomes apparent when reviewing the files. Rather than a single file featuring both videos (which would mean part of the front camera footage was obscured) you actually have two files that are named almost the same, but one is A and one is B. Opening them you get to see a lot more than a single camera setup, the front camera captures the usual footage of what’s happening up ahead, the rear camera adds a wide angle shot that shows what is happening behind and to the side of you. So if something were to happen you get a much better idea of how it has happened. In a single camera setup you’ve covered the front, but if something hits your side or rear you’re not going to see it happen, with this you will. The camera also records sound. I did actually talk to the camera for the video review to demonstrate the mic pickup but realised on reviewing the footage that because two cameras are recording at the same time my footage had been lost. I was using a 4GB card, but I’d recommend getting 32GB (the largest this supports) to ensure you have lots of room for both cameras footage. It’s be good if a large memory card and GPS was included out the box, but this would drive the price up as this manages to deliver two good quality cameras for not much more than some single camera setups. 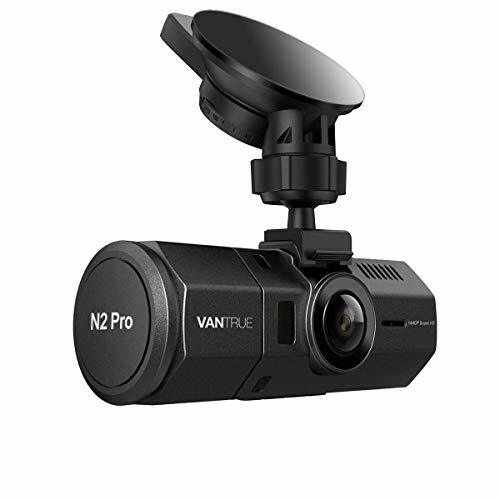 【Infrared Night Vision w/Sony Sensor】N2 Pro dual dashcam with Sony IMX323 sensor, F2.0 6-glass lens rear facing cam plus 4 IR LED lights enhances night vision in car at low light environment, making your driving more safer at night. F1.8 6-glass lens front facing cam and unique HDR video system automatically balance the light and dark areas of the video. Simply toggle the night vision status by pressing the power button. 【24 Hours Parking Mode & Time Lapse】24 Hours Motion activated parking mode makes the dual car camera to auto record once the front or inside camera detects motion. Auto LCD OFF timer ensure you won't be disturbed by another glowing rectangle. Ideal for most climates: -20°-70°C(-4°-158°F). Excellent audio recording with built in micphone. Time lapse function automatically takes photos at specified intervals. Supports up to 256GB microSD cards, recommend to use samsung evo card(not included). 【Continuous Loop Recording & G-Sensor & Optional GPS】The car camera recorder will auto start recording once the engine stars. The car dash camera will automatically delete the oldest file and replace it with the new. G-sensor auto detects a sudden shake/collision and emergency locks the footage to "Event File" thus saving important video files. Optional GPS mount allows you track the driving route and speed. To use gps function, please buy a gps mount (Asin:B01J5KZLQS). 【Safe Guarantee with 18m Product Warranty】Full 18m Warranty, email replies within 24H, and 100% Satisfaction Guarantee. Pay less auto insurance Your witness for accidents and insurance claims Perfect dual lens dash cams for cars, uber, taxis, rideshare, lyft drivers, commuters, and families Works with 12V and 24V vehicles. 【Near-360° Solution & Heat Resistant】Stunning ultra wide angles record road (170°) and interior (140°) with virtually zero fish eye distortion. The rear cam is easily adjustable (80°vertically) for the perfect view. Based on HDR technology, this car cam inside and outside clearly captures more of the road without overexposure during the day and night. Heat Resistant- ABS resin + PC casing- When plugged in: Operates in-20°-70°C (-4℉-158℉). Easy to install and operate. 【Dual Cameras Front and Inside Recording】On dual recording mode,1440x1080 @30fps of front camera and 1280x720 @30fps of back camera record road ahead and inside simultaneously, presenting ultra-high quality and smooth video. On front cam recording, Based on HDR technology, 1920x1080 @30fps Full-HD resolution provides great sharp video quality and super night vision(FRONT CAM) with infrared light for the front cam, clearly captures the license plates as well as road sign during the day and night. 【Dual Parking Modes & Audio Recording】Automatically switch the car camera to the Parking Mode. Triggered by the Motion Detection, the dashcams for cars will automatically record a vehicle near the front of a person or object. Triggered by time lapse,the car camera dash cam will continue to take photos at a set time interval, and then automatically edit it together as a video clip. Built in microphone/speaker for sound recording without distortion, you can also turn the audio off. 【Loop Recording and G-sensor & Auto LCD OFF】Loop recording overwrites the oldest footage with the newest upon filling a card to capacity. Variable sensitivity G-sensor with Automatic Collision Detection locks video files following event. Automatic/Manual lock option. Auto LCD off after the recording begins so you won't be disturbed by another glowing rectangle on your windshield. Support up to 64GB card (not included), please format it to FAT32 first. 【18m Product Warranty w/ Optional GPS】Free for 18 months Warranty to cover any questions and email replies within 24 hours. The GPS function allows you to track speed, location, date and time into video clips, to use the GPS function, please buy a GPS mount.(ASIN:B01J5KZLQS). Perfect dual dash cam front and rear camera for cars, taxis, Uber drivers and commuters. Works with 12V and 24V vehicles, total peace of mind. 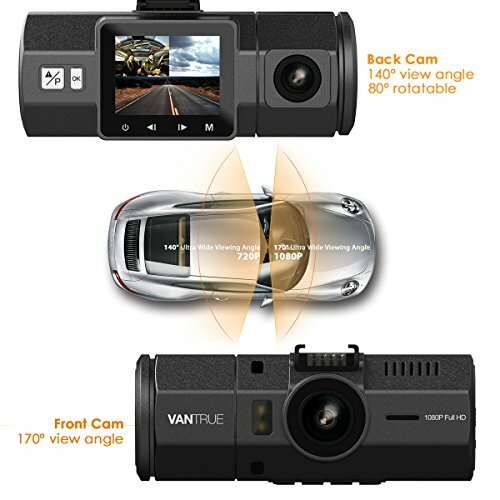 √【Car Camera 1080P Front and Rear】 Dash cam Full HD with front(1920x1080P) and rear(1280x720P), higher resolution and lower price than other dashcams of VGA in the market, it can clearly capture every road conditions and license plates details for further safety. √【Full HD Hidden Car Dash Camera】With stealth low profile design, it will be a spy camera hidden behind the black sun visors. Especially the discreet waterproof rear camera, black appearance can hide it perfectly behind the car. Both your camera and car will be safe. √【Super Night Vision Dash Cam for Cars】With 6 glass fixed-focus lens, F1.8 big aperture and advanced HDR technology, the dash cam can capture more clear and vivid footages even in low-light situations at night to let you drive more peace of mind. √【In Car Camera with Parking Mode】Equipped with auto detection & collision latch features, the auto cam will detect external force and activate to record 30s locked video(won't be overwritten), which will be a strong evidence during claims on hit-and-runs. √【User-friendly Car Recorder with Guarantee】Auto On/Off, sensitive buttons, rotatable screen, audio with fidelity, quite easy to use. And Crosstour CR600 are covered by a one-year warranty and we provide 7*24 technical support with the quick reply. Note: SD card is not included.